Yukraft is a small nonprofit Minecraft server whose goal is to provide a fun environment for worthy gamers. We are proud to offer both official game modes - Survival and Creative! We use simple plugins to aid in simple teleports and admin activities. If smaller community-based servers are your thing then hop online and give us a try - it's free! Help us grow by voting for Yukraft on the server lists below! Thank you for your support! Every vote helps us reach the top! - Separate survival and creative worlds. - NEW! - Simple tp (/home /spawn /tpa <player> and /back). - New world and community - lots of space to make your own. - Experienced and mature staff who will actually help you. - 10k and 25k block random tp at spawn. This is a non-profit server. We're not looking to make any money by doing this; however, we do want to provide a fun and friendly gaming environment. That being said, we can't continue to pay out of our own pockets for server and website fees. Every bit helps! All donations go into a fund that is allocated for only paying server fees. If for whatever reason, the server shuts down all unused funds will be returned to those who've donated in reverse order. If you love playing on here but just don't have the means of making a monetary donation, that's okay! One of the best ways to show your support for the server is by getting our name out there! We're always looking for fun and cool people to come online to play on Yukraft! You've waited! And now they're here! 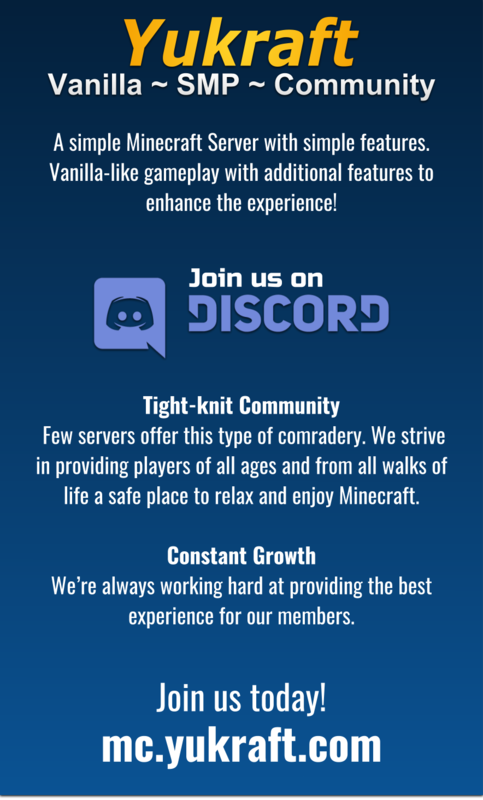 Introducing our Server Ranks! Server ranks are unlocked by playing on the server. We did this to be fair to all users - we want to make it possible to give players who are unable to donate the same kits and number of homes as someone who can donate. We will be opening our shop for those who wish to purchase a Premium Rank to help support the server! We value and appreciate all donations and as such Premium Ranks come with Discord perks and extra cosmetic perks such as /hat and chat/sign/nickname colours. It's just our way to say thank-you for your support! There are 5 levels of and 14 different ranks in total! The more you play the higher your rank will be! Each rank has its own kit as a perk - do /kit <rank name> to get your loot! We've reset everyone's play-time in order to have a level playing field. The time that shows up on our website is total play-time since we opened, not what is tracking your rank. To check your current time do /ar time in-game and it will tell you your current total. If you have any questions, feel free to contact staff on our Discord Server! Yukraft has reached a new record of 75 registered users today!